The older bottles at our Port tasting included vintages 1963 – 1983. At least three of them must be counted among the greatest Port vintages of the 20th century. We approached the challenge of removing the corks with a great deal of caution. There are Port tongs, a traditional method for dealing with the problem of old and crumbling corks. I’ve used them, and they are a lot of fun, but they require both fire and ice, a fair amount of nerve, and are best suited for opening just a bottle or two. If you are using a waiter’s corkscrew, you want one with a teflon worm and a double hinge. But no matter how carefully you insert it, how gently you tug on it, the odds are the cork will not come out intact. An ah-so is a better choice. If you have never used one, do not practice on an old bottle of rare wine, Port or otherwise. They require a certain touch that takes a little time to develop. I have successfully used an ah-so and a waiter’s corkscrew in tandem on occasion. You insert the corkscrew at a diagonal so that the ah-so may be worked straight down on the sides of the cork. The corkscrew anchors the cork so it cannot be pushed into the bottle, while the ah-so loosens it and together, with supreme care, they may work it out intact. For several of our older bottles, none of this prevented crumbling. Where a small bit of cork remains in place, I suggest you blow the crumbs out without disturbing the bottle, then push the remaining bit of cork down into the wine, and immediately decant it. Pour through a strainer (some people use cheesecloth, but I am not a fan of that method) and it should catch most of the big bits. Having successfully gotten all the wines into decanters, we briefly debated whether to taste old to new, or new to old. Not knowing how long the oldest vintages would remain at their best, we decided to begin with the 1963 and work our way forward. This turned out not to matter much, as the wines were still drinking well at the end of the two hour tasting. But it seemed better to be safe and do the oldest first, with the added advantage of fresh palates at the start of the tasting. Here are my notes on the older half of the flight. 1983 – Second best wine of the night. A finesse wine, silky and complex, with lush notes of vanilla, toffee, Kahlua, maple syrup, even amaro. Spicy plum cake, supple and long. My favorite of the middle flight. 1980 – Dark, meaty and substantial, this seemed to be the heaviest of the older Ports. Prune and fig, coffee, vanilla and butterscotch flavors invigorated a thick, lasting finish. 1977 – This is definitely a vintage to drink now, as it seems to be turning a corner. Not tired, but vinous, heady, with a mix of rose petals, black tea and tobacco around delicate cherry fruit. 1975 – Rather pale, this was the thinnest and most alcoholic (in terms of the burn in the back of the throat) of the night. Rather sugary flavors of raisins and dates made it the least impressive of the older wines. But on its own, it would have been a perfectly fine drink. 1970 – At first tight in both aroma and flavor, this opened slowly to become my favorite of the first flight. A smooth core of molasses and maple syrup gave it a supple, concentrated mouthfeel, luscious and deep. Great structure and length, with plenty of life still ahead. 1966 – Many in our group were not born when this wine was harvested. Full-bodied with cherries, plums, candied pineapple, orange peel and more, this was surprising in its complexity. A mellow, toffee-flavored finish. 1963 – This was an unusual bottle, with a plastic cap over the cork, and uncertain provenance. A lovely sunset color, it displayed scents of sweet raisin, brown sugar and sour cherry. Though showing its age, it was nicely complex with maple syrup, Kahlua, molasses, cloves and spices. 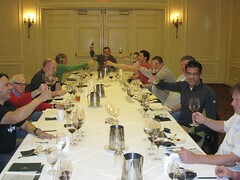 The general consensus was that this was the finest tasting yet for our group. It is the sort of special event comes along very rarely, even for those in the business. A great pleasure for one and all. For another complete look at this tasting, visit Rand Sealey’s Review of Washington Wines. 1975 is a rare Grahams vintage. Never had that one. Anon, I am guessing that the '75 was rare because very little was made, and very little was made because it was not an especially noteworthy vintage. It was certainly one of the lesser bottles of the evening. I am sooo glad you enjoyed the wines. There was very little estate bottling before 1970, hence the unusual bottling of 63. I did obtain it from a VERY well known importer here in San Francisco. Roy respects him also. Thanks for sharing your comments.